Two months ago I wrote an entry regarding the dedication of the famous Robert Gould Shaw Memorial across from the State House in Boston. 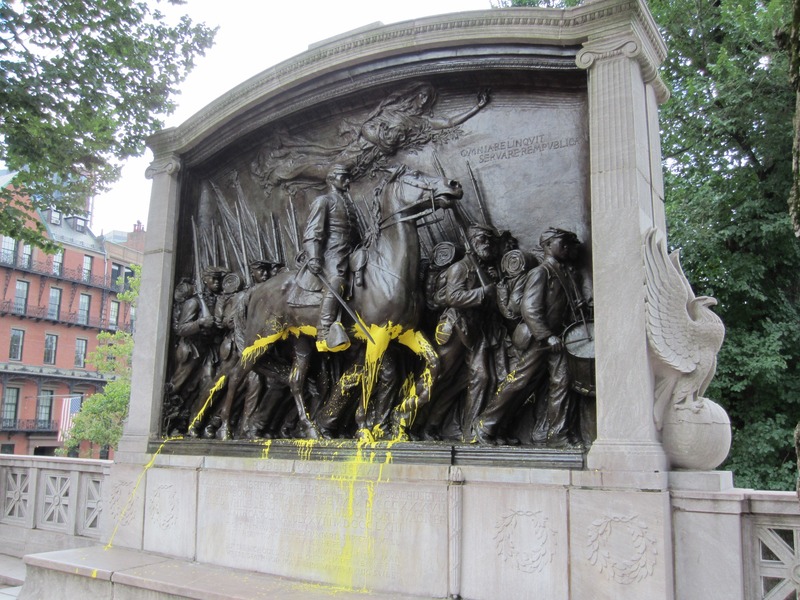 Sadly, a woman yesterday saw fit to empty a can of yellow paint on what I think of as Boston’s most beautiful Civil War monument. You can read about the details here and in a variety of other news sources. Apparently, prior to this episode, she tried to break the sword from Colonel Shaw’s grasp. It is perhaps a waste of time to ponder the motivations behind such an action. And yet I can’t help wondering, what about the monument so upset her? The answer is probably not a rational one. According to the news reports, the woman was detained by a man whose daughter was also splashed by the yellow paint. He kept the vandal there until police could arrive. Bully for him! I wish I could shake his yellow paint-stained hand. I happened to have a meeting at the State House in Boston today and so I had a chance to examine the monument and take a picture or two. Despite the paint and the police tape surrounding the memorial, tourists were happily posing for pictures in front of it as they always do. I watched numerous groups and heard them speak admiringly of the memorial. One teenager in particular caught my attention, asking his parents to take many pictures of him in front of it. Perhaps more than they had patience for. But he seemed truly caught up in the moment. While I stood there for about ten minutes, quietly observing, no one mentioned the paint. They simply admired the monument, the memory of Robert Gould Shaw and the 54th Massachusetts Infantry. I take that as an indication that this vandal’s actions were truly meaningless. At the meeting I attended, I learned that the clean up effort will commence tomorrow. Let’s hope it goes smoothly and quickly.